Kstovo – November 26, 2014. Within the frames of vocational guidance, on November 26 an excursion to the process area of RusVinyl LLC, a new PVC and caustic soda production plant, was organized for the students of the chemistry faculties of the lead Nizhny Novgorod Universities. More than fifty students together with professors of Nizhny Novgorod Technical University, Nizhny Novgorod State University, Dzerzhinsk Polytechnical institute and Kstovo technical oil college got acquainted with the most up-to-date and safest technology to produce one of the most widespread polymers – polyvinylchloride (PVC). Employees of the company told future chemists about technological stages of PVC production, equipment used at the plant, RusVinyl approaches in the field of industrial safety, environmental and labour protection. As well the students visited the central control room of the plant and the production laboratory, which possesses a large fleet of latest-generation instruments as well as a wide range of methods for analytical control. After the tour was over, the participants managed to talk to RusVinyl LLC CEO Guenther Nadolny and ask questions about the plant. RusVinyl LLC expects to organize such-like events on a regular basis and develop the relationship with industry-specific schools. 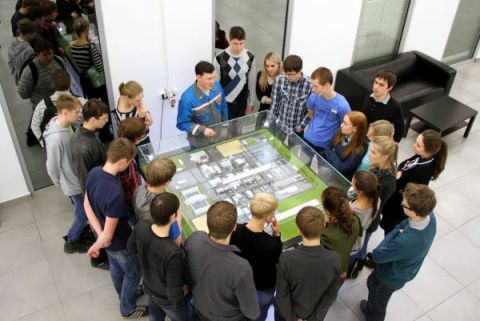 «Knowledge received during the visit to the plant in Kstovo will come useful to our students who intend to be professionally involved with chemistry in the future. It is an example of a modern petrochemical plant which can be recommended as a future workplace», - remarked Alexandre Sulimov, Doctor of Engineering Science and associated professor of Organics Technology Chair of DPI, after the excursion of the plant was over. «Our company is interested in highly qualified personnel. And we have to start the training of such personnel right now. It is important that young generation and professors who conduct the pedagogical and educative work with students, receive up-to-date and useful information on our plant, can see the modern chemical production and we will be glad to participate in a live and open dialogue. It is worth noting that the vast majority of our operating staff are graduates from technical higher education institutions of the Nizhny Novgorod region, which prepare highly qualified specialists who confirmed their high level more than once», - explained Ekaterina Gershman, RusVinyl LLC Staff recruitment and Training Department Manager.